This fish is work in progress for Steuben for a project that may be 6-12 skus with the need for 6-12 illustrations relating to nature, animals etc. on a hexagonal shape. What seems to be emerging is the work that I am doing in black and white is splashing into this more formal/reduction style and this fish is an example of where it could go. As clear glass is colorless, the engraving or monairing process renders black and white cleanly. To get a grey, thin texture must happen for it to be successful. 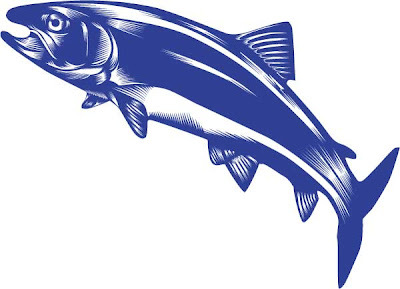 The trout will be in water (white) with maybe some cattails, and the fish will be glass (shiny). I am hoping this project happens (albeit it is always in a crunch situation and not much development time) as I am learning a lot about the process, what style of illustration works and working one color is cool and interesting and has "legs" in the work and in logo work for the design business. I am liking what I see and want to share the progress with you. There is a slight possibility some of my dog images may be used in a waiting room --big scale. Would do some new images in color for a horse, a llama, a beagle, a lab and a cat which may morph into the Baker Annual Report for this year. It would be cool if these pictures could be used as murals or a hook for this waiting space. Great recognition and would really look original. Crossed fingers. Packing and parceling today. Prep for our trip (LA) along with the charging of phones, ipods, computers etc. for the day on the plane Reference materials and project lists are printed so some work can be focused. Should be fun. R. set up my new artograph superprism opaque projector which promises to be a lot of fun in the new year. Money is in hand. Extra bags of dog and cat food acquired and ready to go. The weather is in the high or low sixties out there...so what to take to wear is a little dumbfounding...so I need to go and figure this out.